﻿ Legazpi Airport Hotel (Philippines) | FROM $16 - SAVE ON AGODA! "The staff is accommodating, a decent restaurant a stones thr..."
Have a question for Legazpi Airport Hotel? "The bedding sets are clean while the towels and blankets have a fresh scent"
"The staff also is very helpful with our requests"
"Will definitely stay there again when i'm in legazpi"
"The free buffet breakfast is also good." 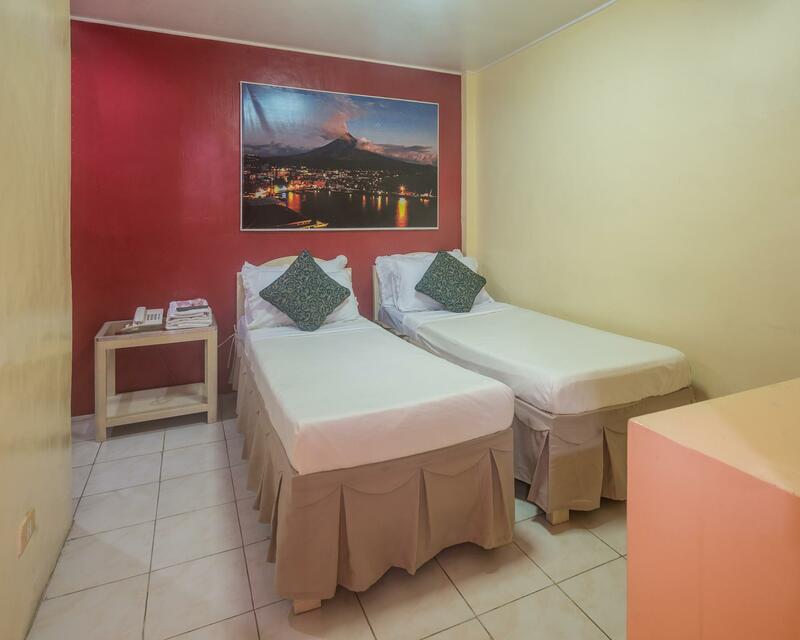 Ideal for fun and relaxation, Legazpi Airport Hotel is located in the Cruzada area of Legazpi. From here, guests can enjoy easy access to all that the lively city has to offer. A haven of rest and relaxation, the hotel will offer total renewal just steps away from the city's numerous attractions such as Legazpi Airport, Bicol Heritage Park, ATV At Lignon Hills Nature's Park. At Legazpi Airport Hotel, every effort is made to make guests feel comfortable. To do so, the hotel provides the best in services and amenities. Top features of the hotel include free Wi-Fi in all rooms, 24-hour security, daily housekeeping, Wi-Fi in public areas, car park. The hotel features 24 beautifully appointed guest rooms, many of which include television LCD/plasma screen, internet access – wireless (complimentary), air conditioning, television, satellite/cable TV. The hotel offers an excellent variety of recreational facilities, including massage, garden. Discover an engaging blend of professional service and a wide array of features at Legazpi Airport Hotel. 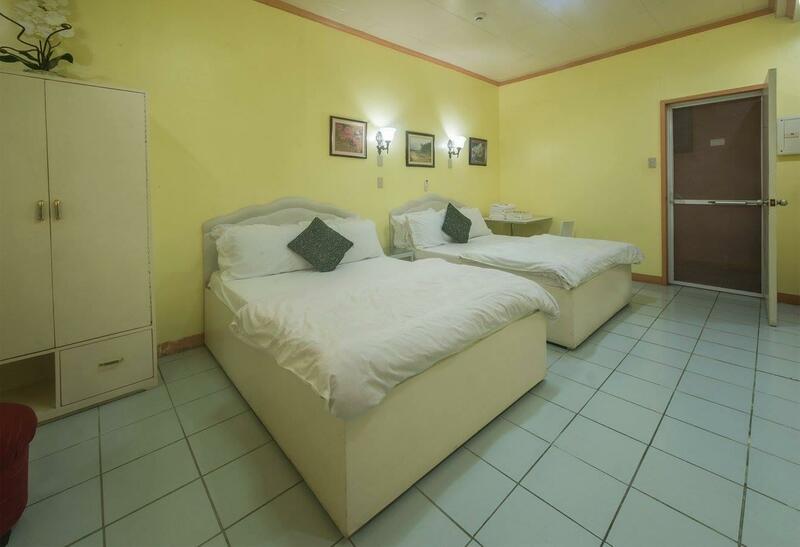 "The place is very affordable and definitely worth your money..."
If you're planning to go on a trip and needed an overnight place to stay near the airport, legazpi airport hotel is quite an a-okay (i have no choice) place to stay. The main concern I had was their ultimately poor water supply specifically their bathroom. I stayed in a single room (if that's what they call it) and when the time I tried to hit the shower, the water drips so slow (somewhat like how the IV fluids run when you get admitted in the hospital). It literally flows like 100 drops of water per minute. It took me about 5mins I guess just to fill the small bucket. I was supposed to use the shower with the water heater. But it is so dysfunctional coz when I turn on the water temp to low or medium level, the water that comes out was so freaking hot. I am not so sure how the water supply turns with the other rooms. This is just based on my experience. But, i gotta admit, their staff are very nice. The hotel is right smack inside the airport premises.Hence, when I arrived last Friday, September 24 despite the rain, I was able to walk there.The bedding sets are clean while the towels and blankets have a fresh scent.I was surprised that the single room for extra bed can actually ft four people. Usually, the single bed I know from other hotels only fits one person but here two people can sleep on the bed. The room given to us (Rm.333) is separated from the the main building.Therefore, it has more sunlight and air circulation. The staff also is very helpful with our requests.One thing though, there are no phones connecting the front office so you really have to go there to ask for something.The water dispenser is also located on the other side of the hotel.I suggest that there should be one on the other side too.Then, the front desk is not opened 24/7.They close at 10 pm. However, the guard can be of help too. If you need to be on an early flight, this is the best location to stay for a night. The staff was bery friendly especially when we had our flights cancelled. Our room was clean and there is hot water. basically the hotel is next door to leagzpi airport terminal. can't be more convenient for traveller. nice staff, friendly and helpful. their full breakfast is more than great, though we didn't have enough time to enjoy. so many food choice, very different from any other hotels/resorts of this price range we stayed in ph. It was so easy when we arrived in Legazpi and when we were flying out since the hotel was inside the airport premises. The food was great. Their breakfast buffet had non-breakfast dishes as well. And since it was buffet-style, it can last you for the whole day. Some confusion about my being in the room was the only issue that flawed and otherwise good stay at LAH. Would still return there at the end of my trips as the convenience of waking up late and being 1 minute from airportSecurity makes it extremely convenient to get to the departure gate on time. 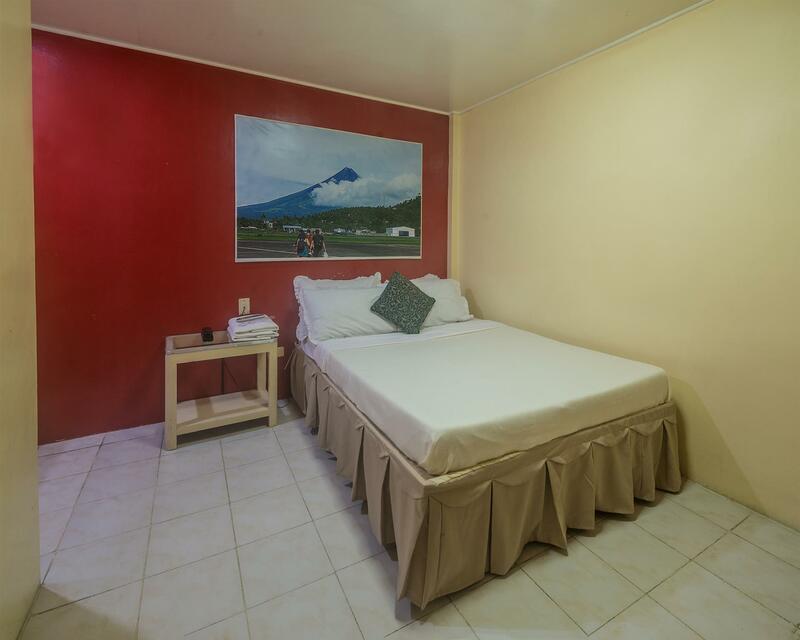 Legazpi Airport Hotel is conveniently located between Daraga and Legazpi. It is inside the airport compound thus we didn’t have a hard time checking in before our flight back to Manila. The hotel was old but was newly renovated. The aisle to our room was a bit cramped and had no view but our room was comfortable enough. Mt. Mayon can be seen right outside the hotel anyway. Our room had an aircon, two single beds with two very plump pillows each. There were tables to put our things though no rack to hang our clothes, which was fine. The TV had cable although there was no WIFI in the hotel. The bathroom was small but clean and had hot shower. They also provided towels, a roll of tissue, shampoo and soap. What I like best about the Legazpi Airport Hotel was that they also had free breakfast buffet (worth Php150) at their restaurant beside it. The food was good and there was a pianist to play live music which reminded me a lot of the songs my grandfather used to play. The place is very affordable and definitely worth your money. Although the room isn't very spacious, I like that it is clean and each room has its own bathroom. So, instead of renting a house or a huge family room for all of us, we got ourselves a room for each family since the price is cheap. We won’t have to line up to take a bath and we could have a quiet/restful evening after a long, tiring day of sightseeing, since the toddlers are separated from each other. They also offer buffet, which I highly recommend, because they serve delicious food with lots to choose from. We've tried other buffets in Bicol but theirs is worth going back to. Great location. You can conveniently walk to the airport. Good for when you have a very early flight out. If you can't avail of the buffet breakfast which starts at 7:00 a.m., you can order a la carte for dinner and have it delivered to your room instead. I decided to stay here rather than the other hotels nearby because of the high rating the hotel got from previous guests But I must say I was disappointed about the condition of the hotel. Yes it's clean but it seemed a bit rundown, the aircon was noisy and do not get cool enough ( I think it's centralized so the controls are disabled), the bed is hard and the pillows are to thick, one of our rooms had no phone (a pain when you're trying to order food). For a little more amount, you would get a room in a newer, swankier hotel nearby. The plus side is the staff who are very helpful. The free buffet breakfast is also good. Good hotel right at the airport. It's a budget hotel, so don't expect any frills, but the staff are very good. You can order food for delivery or its not far to the shopping mall. Buffet breakfast is very good. Fine hotel for a single night. I was there for three and nobody ever cleaned my room. Shower was pathetic. It's far away from everything so it's only real value is if you are catching a plane the next day. Staff were perfunctory though there is not really much for them not to be perfunctory about. Good buffets. Had the breakfast and lunch buffets and they were both very good. The hotel overall was good. The location is convenient to the tourist destination in Albay. Good buffet breakfast and very confortable bed. Problem is, there is no coordination between the hotel and airport security. You will be shocked that you have to pay Php 100 per day for your parking which nobody from the hotel informed you about it. Stayed at this motel/hotel May 2014. Got a room facing the airport tarmac, I had a nice view of the Mayon Volcano, blue skies and a few jets landing and taking off. The hotel is conveniently located within the Legazpi Airport complex, you wont miss miss your flight except if you over-slept. The room is generally clean but the hotel is on the verge of being a run down. Service was good and the staff are very attentive. Overall, Convenient, quaint but nice, and it's a good value for your money. We were fairly a large group. Our meeting place is the restaurant for breakfast. Every one in our group commented on how good the food selections were, and good tasting. They even have a piano player that played classic Pilipino songs. it was a very convenient hotel, good value and the basic stuff you need in a hotel are available. its the nearest hotel to the airport i think so its good especially if you have late or very early flight.